The Museum at Prairiefire, located 20 miles south of Kansas City, Missouri, is designed as a regional civic hub containing educational traveling exhibits from the American Museum of Natural History in New York. The project, designed by Boston-based museum architecture and planning firm Verner Johnson, was inspired by one of the most unique aspects of the Kansas tallgrass prairie: the prairie fire burns. These controlled fires, which can be traced back to Native Americans, suppress invasive plants that help rejuvenate native grasses, promoting plant and animal diversity. The project involves two box-like volumes connected by a free-form volume of space clad with color-shifting materials compositionally organized to evoke flame bursts and spark-like effects. 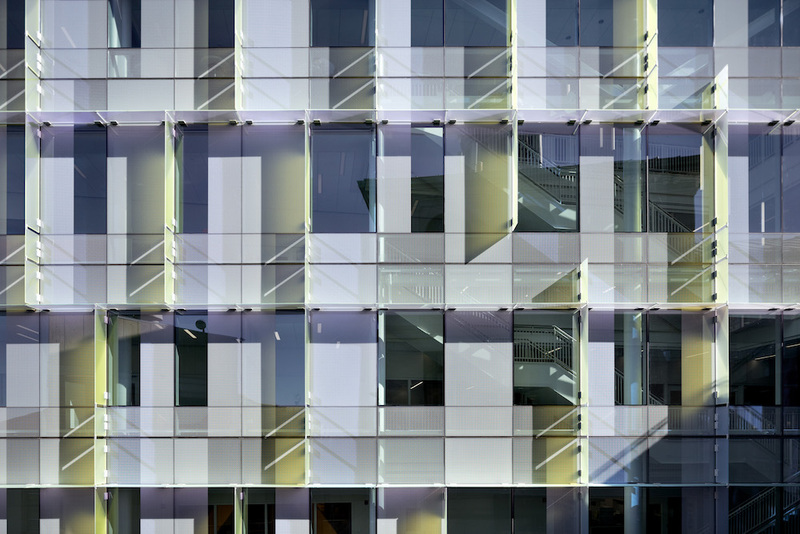 The faceted nature of the building perimeter, paired with a unique material palette of dichroic glass and iridescent metal panels, produces a dynamic envelope that changes with varying environmental light conditions. Jonathan Kharfen, Principal at Verner Johnson, said the concept to evoke fire was a core focus of the design team from very early on in the project. "If you have a strong concept, then all of your decision-making must support that concept—details, massing, materials—everything." Narrow tube columns are spaced 25” apart, encouraging people to stand between them. The architects say this apparent lack of structure makes the Great Hall volume float, expand around corners, and dynamically engulf the visitor. This structure is employed as support for the building envelope which consists of a structural silicone glazed system (SSG) of fixed insulated glass units (IGU) and a stick-built insulated exterior wall with metal panel cladding. Dichroic film is a transparent material that appears to change color when viewed from various angles. By faceting the plan geometry of the exterior walls, a wide range of color was achieved by one type of film. The film is laminated between two sheets of glass, which is placed into an IGU assembly. 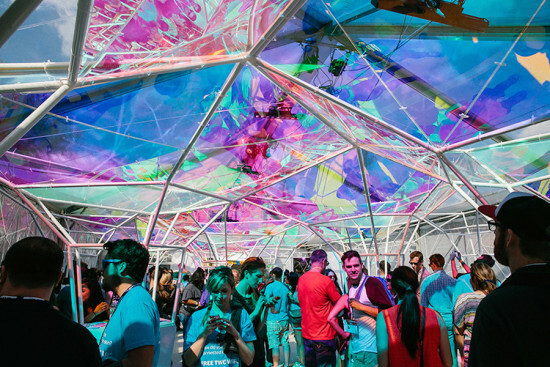 "As far as we know, dichroic has never been used in this way," said Kharfen. The glass units are compositionally arranged within a standard flat seam cladding system of metal panels. The color effects of these panels are produced by an electrochemical reaction between stainless steel and chromium oxide which builds up the material to specific depths. Ultimately, four different colors with various finishes were used on the project. The distribution of the tiles in a "paint-by-number" tiling pattern was determined by the architects well ahead of the final installation. "There was a lot of work that went into developing languages of the glazing and metal panels," he said. "To get to a realization of the concept you are working with is a long process—and to me, it's a process of developing a language with that material that evokes what you're trying to communicate." 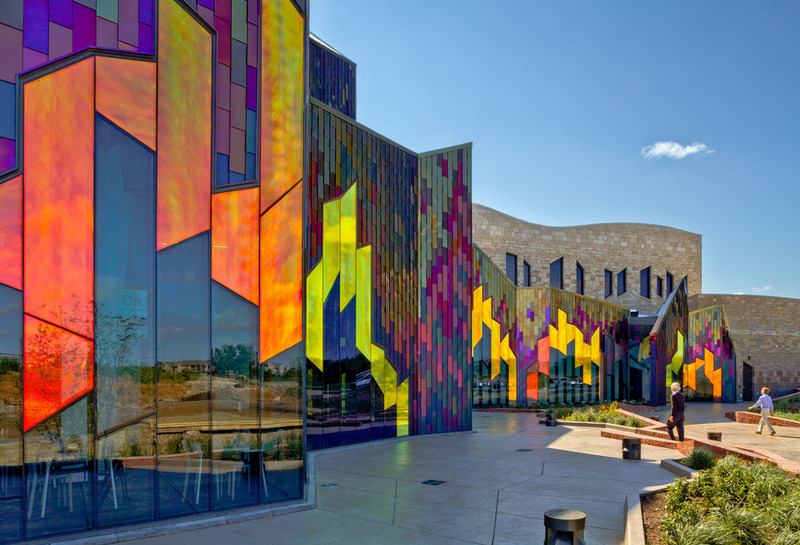 The dynamism of the metal panels and dichroic glass is cast against a stone veneer backup wall composed of a color mix that has been arranged in a gradient coursing. Bands of stone with specific percentages of color mixes helped to translate this concept into reality. The bottom 15 feet of wall shifts from limestone to an engineered stone product, which embeds into an undulating landscape that surrounds the building.